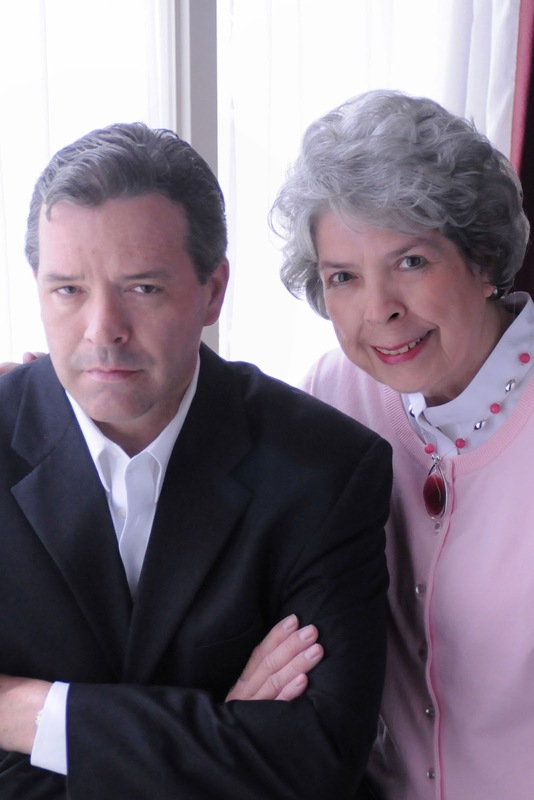 DEBORAH CROMBIE: Two of my very favorite writers are the mother/son writing team of Charles and Caroline Todd, who write as CHARLES TODD. Their books featuring shell-shocked WW1 veteran and Scotland Yard policeman Ian Rutledge have been enormously popular and have received every critical accolade. 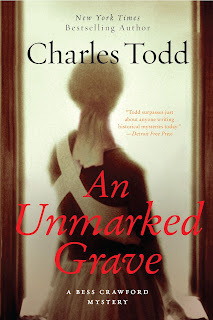 But a few years ago, deciding that they weren't content to write one book a year, the Todds began a second series featuring WW1 battlefield nurse Bess Crawford, and the latest Bess book, An Unmarked Grave, will be out in just a few weeks. As the Todds and I share a publisher (William Morrow,) I've been fortunate to have done a number of book events with them these past few months, and I've been fascinated not only by the books themselves, but by listening to Caroline and Charles talk about how they work and what inspires them. DEBS: The Rutledge books, which are set just after the Great War and which deal with the ongoing consequences of Detective Inspector Ian Rutledge's experiences in the war, particularly his shell shock, have been very successful. So what inspired you to write about Bess, a nurse and amateur sleuth, and to go back to the war itself? CAROLINE: We’d talked about Bess for ages, but wanted to wait until we were sure that Rutledge was well established before tying up time and energy for another series. In her case, we had two goals, to show how women coped with the war, and also to give people a chance to understand why Rutledge had come home damaged, to see what he’d faced in the trenches. What surprised us about Bess is that she practically wrote herself. She's such an interesting person, and is such fun to work with. This must have come across to the reader because Bess became popular almost overnight. What’s more, we were looking forward to her second adventure before the first one even hit the bookshelves. CHARLES: English women have always stepped up when they were needed, even running the castles during the crusades. They've also traveled widely and independently, which gave us a great background for Bess. Her father was a career army officer, and so she knows about weapons. Her childhood was spent at Army cantonments around the world, and so she has a different upbringing from that of the average Victorian woman. All this gives her an outlook on life shaped by a sense of duty and a sense of service. It's not surprising that when war broke out she wanted to serve as a nurse, just as her father's son--if he'd had one--would have served on the battlefield. Yes, it was going back to the war, but it was going forward to peace as well. DEBS: Can you tell us a bit about the story in An Unmarked Grave? CAROLINE and CHARLES: Bess is in France, dealing with the wounded and now the influx of patients with the Spanish flu. That’s what they called the terrible Influenza pandemic that killed so many people all over the world, including members of our own families. Among the dead awaiting burial is a body that shouldn't be there--he wasn't a victim of war wounds or of the flu. He was murdered. But before Bess can report his death, she herself succumbs to the flu and nearly dies. By the time she is fully recovered, the discovery of the body seems to be a distant troubling dream. But as she tries to convince herself of that, she finds that the only other witness to the discovery has hanged himself--or has he? As Bess delves deeper into memory and tries to pin down facts, she begins to realize that the dead man in the shed was not the first to die by an unknown hand, nor the last. And it’s likely that she’ll be next, if she doesn’t watch her back. That danger could well touch all those she loves most dearly, and now Bess must race a killer to his final target. DEBS: One of the many things I love about the Bess books is their sense of immediacy. As a reader, I feel Bess's experiences so vividly. Some of this is due to the first-person narrative style, but I wondered about your research. Have you visited the sites of the Allied lines in France, where, as a nurse, Bess would have been stationed? CAROLINE: We’ve made an effort to visit French museums and French battlefields, and we've got a copy of a Physician's Reference for 1908, which helps with the medical details. So the research is there. Nurses write that they respond to her sense of dedication. What we discovered was that first person really makes Bess come alive for the reader. Rutledge is definitely third person as the professional detective, but for Bess, we needed to be a part of what she was seeing and feeling and doing. Amazing, really, because characters seem to know what's best for them. From Chapter 1 in first person, she literally leapt off the page. Writers like to talk about Voice, too, and Bess found her own. She’s fresh and different and intensely involved in her life, and whether you’re twenty of sixty, you have to respond to that. CHARLES: Much of the research we've done for the Rutledge series has given us a good feeling for the period in which Bess works. And so one series builds on the other. We'd had strong women in the Rutledge books, so we weren't surprised to find we could write a strong woman on her own. And she's as riveting to write about as she is to read. Still, a story has to come down to setting and plot, and we have a drawer full for Bess to draw on. DEBS: I recently recommended the Bess books on 20SomethingReads, a website librarians use to find suggestions for younger readers. Bess is strong, independent, adventurous, brave--and sometimes stubborn, all traits that I'd hope contemporary young women and men would identify with. Were you thinking about the appeal to a younger audience when you conceived the series? CAROLINE: Bess offers so much to the younger reader, male and female, because she's young too and she's trying to make a go of her choices in life. We’d seen the success of Harry Potter, who had such a broad appeal to readers, and we realized that the real wizardry here wasn’t just happening in the story, it was the way the story was told, it reached out and grabbed you and said, here’s great adventure, come and see for yourself. We try to do the same with our books, and Bess is a woman any woman can relate to. What’s more, male readers love her. I don’t quite know how we managed that, but we’re enjoying it. CHARLES: I was told recently by a woman in her twenties, “I bought your latest for my Mom, because she’s a nurse and she loves the series. The next thing I knew, I was still reading at midnight, and couldn’t put A BITTER TRUTH down. Now I can’t wait for the next one.” Remember, Rutledge isn’t quite thirty, he’s an attractive, haunted man who has a job to do and must face it every day, just like the rest of us, even if he’s an Inspector at Scotland Yard. Bess is in her early twenties, caught up in the middle of a war and trying to do her bit. You care about these characters because they seem so real, and you want to know what’s happening next. That’s because the stories are fresh, and the plots involve you. That’s what reading is all about. CAROLINE: When the war ends--as it must, Bess has to learn to live with peace. She’ll be invited to an Irish wedding, in spite of the Troubles, and she’ll find herself in a very different environment where no one dares to trust his neighbor or his friend. And Melinda Crawford wants to go back to India, where she had lived for many years. At her age, such a long journey is very arduous, and so she invites Bess to accompany her. And Colonel Crawford sends Simon with them to protect both of them. We'll learn more about Simon in this one, and about Bess's childhood. But wherever Bess is, can murder be far behind? This is just a sampling of what’s ahead. Will Rutledge and Bess ever meet? We don't know. Would she pick up on his shell shock? Interesting idea. How would he feel about that? Hmmm. CHARLES: Bess is a battlefield nurse. This is the crucible where she learned to be an independent and engaging young woman, no longer in the shadow of her famous father. And that's where the end of the war will find her, learning to live with peace, learning to move on. It won't be easy, and as anyone who has survived a war will tell you, it will leave its mark. And so Bess must make her way into this Brave New World that isn't anything like the dreams people fought to save. That's why we will take her to Ireland, and then back to her roots in India. Bess never goes looking for trouble. It finds her. So life will never be dull for her—or her readers. Whoever they are. DEBS: Thank you both! I've cheated a bit, having been lucky enough to read the galley of An Unmarked Grave, so now I have to join the nagging hoard WHO CAN'T WAIT FOR THE NEXT ONE! I have to warn you, though, this is a dangerous proposition--if you haven't read one of the Bess books, you will then have to read them all. And if you haven't read the Rutledge books, you'll have to read those, too. So clear the decks! Bess sounds wonderful. Putting the new book on my TBR list. And I love the idea that some characters talk to their authors in the first person, others in the third... which isn't quite what you said but still. Can you share just a little bit about how the two of you collaborate? How do you divide and conquer, or do you? I'm thoroughly hooked on this series and can't wait for the next. Pick me, pick me!! Being a bit--just a bit--obsessive about physical details, I want to know where Bess's flat is in London. And her parents' house in Somerset! My mother was an Army nurse during WWII so Bess is speaking directly to me! Hi, Caroline and Charles! Thanks for joining us today. What fun! I love both the Ian Rutledge series and the Bess series, but I came to them backwards. I read the first Bess book and loved it, then went searching out other Charles Todd books and found Ian. Much as I love both, I think I must say Bess is my favorite. What I want to know is when the movie/TV series is to come. These books (both series) are perfect for the Downton Abbey crowd. Indeed, I've recommended them when Downton addicts wanted something to get them through until the next season. I have been a fan since the first Rutledge book came out. That time period happens to be one of my favorites. I am looking forward to reading the next Bess Crawford. I stumbled upon this series when a friend recommended A Bitter Truth. I read that one in a couple of hours and can't wait to read the latest. These novels have an excellent blend of suspense, history, and a very strong character. You all know I have a huge crush on Rutledge..I think the Rutledge books are incomparably great..and I am an unabashededly huge fan of the Todds. And as for how they work together--I interviewed Carolyn at ALA and asked the same question--and the answer knocked my socks off. (Okay, metabphorical socks.) I'll let them answer you--but my response was: "You write each book TWICE?" As for Bess meeting Rutledge--can you IMAGINE what problems that would cause? If Rutledge fell in love with Bess and was happy? There would be huge ramifications. On so many levels. Wow. Thank you for a wonderful interview. I'm completely hooked on both series. I used the Rutledge series as part of a paper I wrote for graduate school (Masters of Library Science) this past spring, and now the professor has become a fan. By the way, Charles, that photo of you is heart-melting! Fascinating premise (for both). I'm always amazed by authors who can write multiple successful series. Hats off to a great team. I am on the second book, An Impartial Witness, and I already can't wait to get to the third! It is wonderfully written, and hooks you in from the start. I will definitely have to get my hands on the Ian Rutledge books, too! Oh, and I agree with you, Susan-love the picture of Charles! Hey there! Great to see everybody this morning. You asked about how we write together. We didn't have a clue, starting out. So we just worked on each scene together until we were happy with it, then moved on. It helped that we were in different states,out of throttle reach! No, seriously, it worked just fine--until HANK said we were actually writing TWO books. That was a shocker. Still, because we both know everything, research,characters, settings, it makes it easier to do this. We don't outline, so going scene by scene helps us build the story as we go. It's really sort of revising-are-us, taking two and making one, and not each scene gets the full treatment, we may come up with what we want at the start, and like it. Whatever, it works, and we've been afraid to try any other system. Make any sense? Caroline. I had to laugh at the comment about Charles in the photo. I think he was ready to slug the photographer--it was at the end of a long afternoon session and the man said,Look like a serious writer. As if myteries didn't count. But he did such beautiful work I forgave him. I like this shot best. But you should see the photo of Charles looking like a young Orson Wells. It's vanished, wish I could lay hands on it. Lovely to have you on JR. Is this your first visit...is that possible? I'm a fan of all four of you (Charles, Caroline, Bess and Ian)but confess to a not-so-secret crush on the one who let me wear his cowboy hat. And ladies, the picture doesn't do him justice. I love both series. The era between two World Wars is so interesting and emotionally charged for me. Especially a whole generation of women with no hope of marriage. Is Bess going to be one of the lucky ones, do you think? Just love Bess! Can't wait for "An Unmarked Grave"! This interview was so fun to read! I've been a fan of Rutledge and Bess for ages. Caroline, I'd love to hear how you started working together. I've been an Ian fan for awhile. I can't believe I missed Bess! I'm looking forward to reading the Bess books. Two books a years is a heavy workload -- how do you manage it? Also, you mentioned that you don't outline, which gets me wondering: What kind of pre-work do you do before digging into the first draft? I enjoy Bess precisely because she is dedicated, and stubborn, and just a wonderful heroine without the self consciousness I often see in women protagonist of the modern age. Just reserved my copy, and like the others, hope to see more of her. I love reading both series. I love the atmosphere and setting. I'm always totally sucked into the plot! I love the Great War time setting, different enough, yet not so out of reach that I can't relate easily. I'm very taken by the characters as well and I'm charmed by your statement that "... characters seem to know what's best for them." Love that! Charles here now. We're trying to finish the line-edits for next January's Rutledge, PROOF OF GUILT. As soon as that's in, we're off to England to research the next books. Two a year is crazy--but we couldn't make Rutledge fans wait TWO years for his next, and then Bess fans TWO years for her next appearance. The solution? Sleepless nights and long days as deadlines approach. Sound familiar? We all face those! So far so good, we're surviving, but when you love writing about two people like Rutledge and Bess, it is not hard to find time and ideas and energy. Charles again. Prework? Get the setting straight in our minds in England, get the idea going on the first page when we're home, and then with a leap of faith, turn to the next page. It all begins with what if. What if this happened? What if Bess is standing in a railway station on a rainy night and sees a woman sayng goodbye to the wrong officer?? It just grows from there. What took Bess to that station? Why was the woman crying? Grief, loss, love, disappointment? And soon you have A IMPARTIAL WITNESS. Charles again. We don't know whether Bess will be the lucky one, Rhys. It's true we listen to the characters, to see what's "real" in their eyes, so we'll have to follow Bess awhile to find out. "Listening" just means we try not to put words in a characters mouth--we try to find out what they would say on their own. Recording their words, not ours. Doesn't always work, but it helps as a concept for developing them. Sometimes they want to do something else. And often it's better than the idea we started with. So you "listen." Caroline -- we started working together after coming across a centuries old mystery at a Revol. battlefield site. It was intriguing but not our story, so we considered writing our own, for fun, to see if we actually could make it as interesting. So if we hadn't stopped to explore one afternoon--Charles and his Dad and his sister and I, but they weren't history buffs--Rutledge might never have been born! And I just can't imagine a world now without Ian and Hamish in it. Caroline and Charles-- This has been such great fun. Not that it's over, but just to say thanks to all of you for such wonderful comments and interesting questions. Heading to dinner right now. See you later? And Debs, who is going to win??? I met Charles when we both presented at a KillerNashville conference a few years ago. I had the opportunity to speak with him for a while and found him absolutely delightful. Furthermore, the books he and his mother write are great--I'm a fan! Hi Charles! And hello Caroline, whom I hope to meet! Thanks for such excellent reads and rich, memorable characters. Thanks for answering my questions! Have fun in England -- what a fabulous part of the job: tax-deductible travel! Charles here. I had a great time at KillerNashville. Hello, again, Sheila. Interesting comment by Jan, about her mom being a WWII nurse. We've had some wonderful letters from nurses, who like the way Bess portrays the profession. That's a huge compliment. Has anybody seen the cover of AN UNMARKED GRAVE? We've been very lucky with covers. Hank's got a great one coming up in the fall. And Debs, there's a regatta in Philly this weekend. Caroline asked me to tell you. She's also a Clutterbatch fan. The one lines in that series are terrific, she says. Will we ever wind up on Masterpiece Theatre? Fingers crossed. Just to be in that company would be terrific. Charles and Caroline--I think we should both be on Masterpiece Theater! Ian, Bess, Duncan, and Gemma, coexisting in different time planes. What fun today! I just wish we would all be in England together. Imagine how much fun that would be? And I want a full report on the upcoming trip, while I'm slaving away to finish the Duncan and Gemma in-progress. I'll announce the three lucky winners in tomorrow's blog, so tune in everyone, and loads of thanks and big hugs to Caroline and Charles for being here today! What a blast! Gemma and Duncan, Ian and Bess, and the three of us turned loose on London researching. See you tomorrow! It's Blue Bloods time. It seems that every few weeks I read or hear a recommendation for your books. It's about time I started reading them! I enjoy historical mysteries, and I have been drawn to reading about that particular era since adolescence. I have been adding so many books to my TBR list that I'm probably in serious danger of being crushed under a pile of books. It could be days before my body would be discovered. However,to die surrounded by beloved books and most likely with one in my hands - could there be a better way to go? So excited that another book is due to hit the shelves soon! I've loved all of the Charles Todd mysteries. I adore these books, as a nurse myself I find the medical aspect so interesting not to mention the mysteries Bess gets tangled up in. I can't help but wonder what will happen with Bess and Simon though? Maybe it is just wishful thinking on my part.